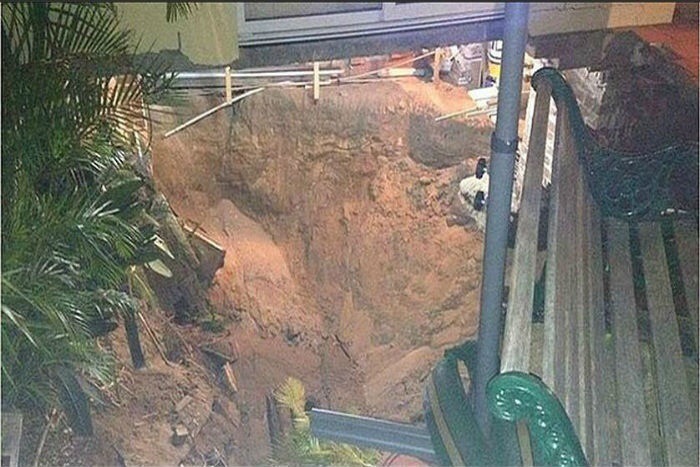 Sinkholes resulting from the presence of old, abandoned mine workings threaten the integrity of luxury homes in the NSW seaside town of Swansea Heads. A sinkhole which is believed to measure as much as 20 metres in width and 10 metres in depth has opened up in the front yard of a three-storey home in Swansea Heads, threatening to topple the structure of the building itself. The couple who own the home returned in the evening to discover it sliding into the gaping sinkhole, with the patio and front corner of their house already succumbing to collapse alongside tonnes of bricks and debris. A second, smaller sinkhole had opened up in the yard of the residence two doors over by the following morning. Mine subsidence board officers said that the first sinkhole had appeared above the old furnace shaft of an abandoned mine situated beneath the house, which was itself built as recently as the late 1990′s. The occurrence of the second sinkhole has prompted fears that the presence of the abandoned mine, which is believed to be around 25 metres in depth, could result in further collapses along the luxury property strip. According to officers the abandoned Swansea Pit, a coal mine which ended operation in 1953, extends below dozens of luxury houses situated on Lambton Parade – a prized swathe of real estate which offers scenic views of Swansea Channel. Despite the damage and structural compromise caused by the first, larger sinkhole, experts nonetheless believe that the home can still be spared from destruction and restored. The officers have used concrete to plug up the holes in a bid to restore the structural integrity of affected houses. The Mine Subsistence Board has launched an investigation into the sinkholes, and is conducting inspections to ensure the safety and stability of adjacent buildings. Experts speculate that the sinkholes are the result of erosion in relation to the old abandoned mine shaft. Greg Cole-Clark, head of the Mine Subsistence Board, said that owners of affected houses would receive compensation for any damage their properties suffer as a result of the sinkholes, and expressed no “undue concern” for adjacent homes. The region’s history as thriving mining hub leaves many new properties potentially vulnerable to the problem of sinkholes. According Stephen Fityus, a professor of geotechnical engineering at Newcastle University, as many as half the houses situated within the geographical confines of the city of Newcastle could be undermined by old mine workings. This entry was posted in Pictures, Structure v Sinkhole and tagged sinkhole, wales. Bookmark the permalink.